Travellers who abandon the highway and opt for the scenic byways will be rewarded with the Turquoise Trail state-designated scenic and historic route, which runs from Albuquerque to Sante Fe through the majestic Sandia Mountains, passing through the revived 'ghost' towns of New Mexico's mining belt. The route begins on NM14 about 16 miles (26km) east of central Albuquerque, covering about 61 miles (98km) before reaching Sante Fe. 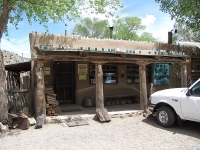 En route is the Cibola National Forest, mining towns of Madrid, Golden, and Cerrillos filled with art and craft practitioners, the Tinkertown Museum, Museum of Archaeology, Old Coal Mine Museum, and the Turquoise Mining Museum.